The height of a work surface can dramatically increase the ergonomics of the workspace. 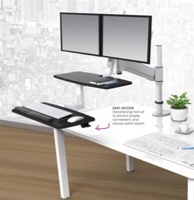 By providing height adjustability, ESI Ergonomic Solutions' Adjustable Work Surface allows for the correct ergonomic height for multiple tasks - quickly and effortlessly. Base features structural steel tubing and a durable powder coat finish complimented by 14 gauge steel columns and cross brace, and a 26.5" travel range. The ESI adjustable table brings aesthetics, functionality and durability to the workspace. A wide variety of sizes, laminate colors, and shapes are available. You can order the electric adjustable table or the crank adjustable table. The height of a work surface can dramatically increase the ergonomics of the workspace. 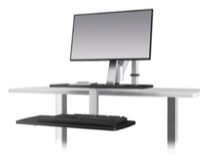 With height adjustability, ESI Ergonomic Solutions' Adjustable Work Surface allows for the correct ergonomic height for multiple tasks - quickly and effortlessly. HAT Desks - Adjusting the height of a work surface can dramatically increase the ergonomics of the workspace and the well being of each work associate. HAT's Adjustable Table allows for the correct ergonomic height for multiple tasks - quickly and effortlessly. Save up to 70% on Adjustable Tables, desks, conference tables, cabinets, and reception area furniture. As an added benefit you receive FREE SHIPPING on all of our height adjustable tables.